July 18, 2013. Global companies in the pharmaceuticals and healthcare industry will spend millions on market intelligence* in 2013. Some biotechnology and pharmaceuticals companies will spend up to US$12 million, while some medical devices and healthcare companies may budget as much as US$104 million this year alone. While this may appear substantial, they are however, not the biggest spenders. By comparison, some manufacturing and industrial companies may commit as much as US$130 million to market intelligence in a single year. With the millions of dollars that are invested in market intelligence, do industry executives think that the time and resources they have put into intelligence have been useful? How efficient do they perceive their own market intelligence capabilities to be? 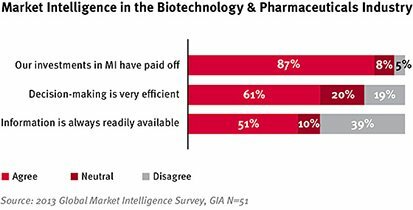 The answers can be found in M-Brain (formerly GIA)’s 2013 Global Market Intelligence Survey, where we compare two groups; companies in the biotechnology and pharmaceuticals sectors with 51 respondents and those the medical devices and healthcare sectors with 55 respondents. Overall, it would seem that companies in the biotechnology and pharmaceuticals group benefit from more efficient market intelligence capabilities than medical devices and healthcare companies ““ even though they may spend just one-tenth of what their medical devices and healthcare peers do. In a ranking of 20 industries in the study,the biotechnology and pharmaceuticals sectors ranked 7th in terms of their market intelligence capabilities, while the medical devices and healthcare sectors ranked 17th. The study also shows that large budgets are also no guarantee of more advanced market intelligence functions. 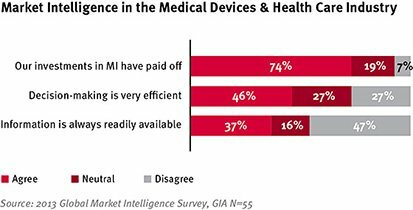 For example, medical devices and healthcare companies spend more than five times as much on market intelligence than pharmaceuticals and healthcare companies on average, yet their market intelligence capabilities are ranked 17th in the study. In addition, the cross industry comparisons in the study showed that executives in the media and entertainment sectors consider their market intelligence to be very advanced, placing them number one overall, but interestingly; the perceived return on investment (ROI) in these companies is the lowest. The industry with the highest perceived ROI for market intelligence is environment and renewables, where budgets are only slightly higher. All in all, it appears that more can still be done to raise the market intelligence capabilities at biotechnology, pharmaceuticals, medical devices and healthcare companies, particularly as a large majority says that Information is not always readily available.